A birthday present for my mother-in-law, more than a month late. 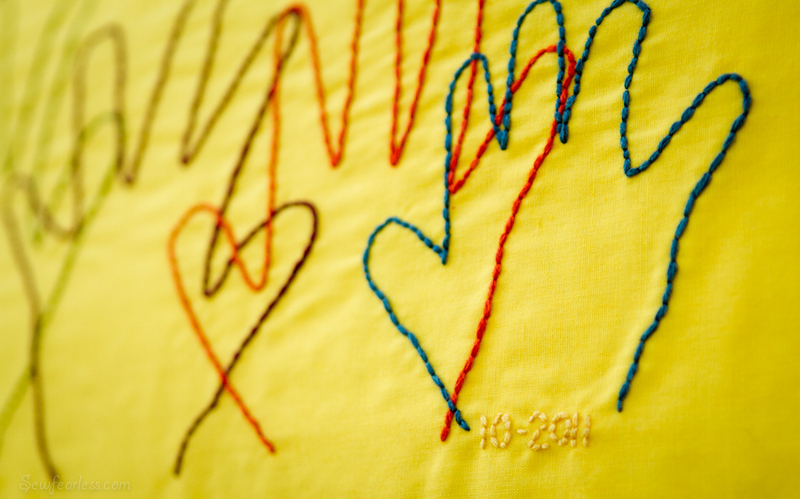 It was a lovely simple embroidery project inspired by a “pin” (which I can no longer find but looked a lot like this). 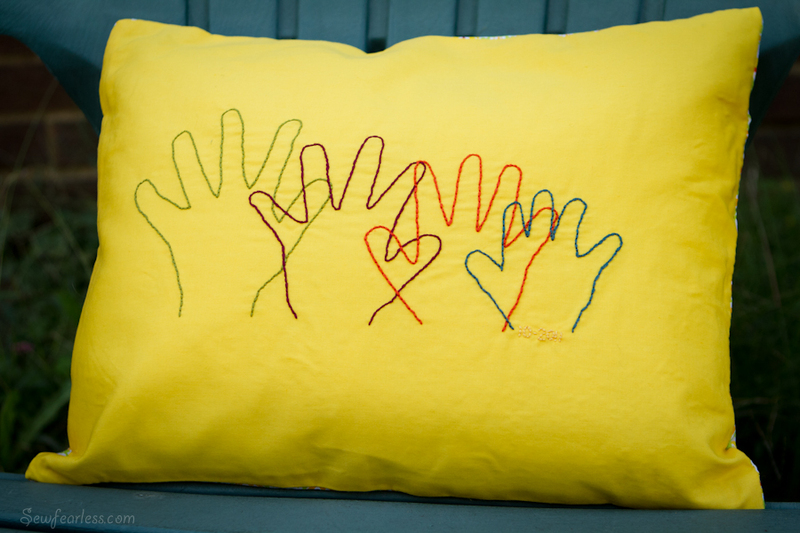 I traced my kids hands as well as they allowed with a fabric marking pen, back-stitched each with a different color floss, and created a cover for a pre-made pillow form. It took just a weekend to whip up and I was looking forward to giving it to her tomorrow. Sadly, my in-laws had to cancel their plans. So, I am holding it hostage until they come visit us. Fresh, energetic, and filled with love! Great piece. 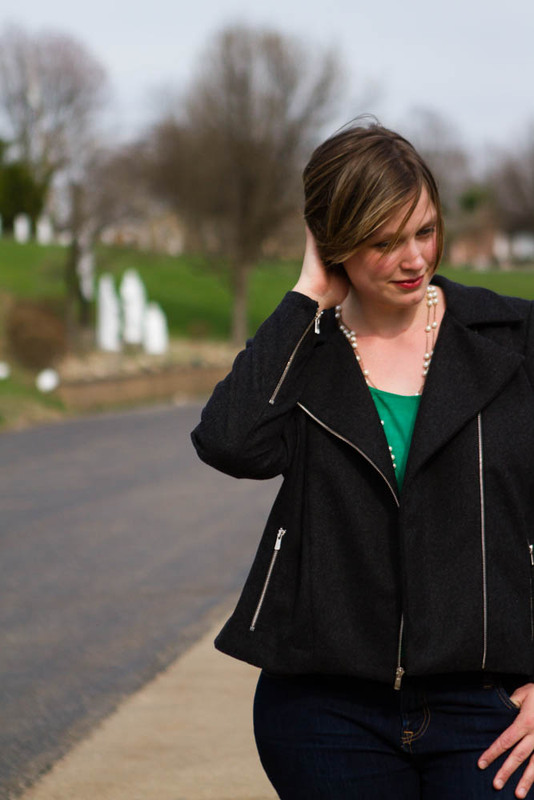 Oh, I absolutely love this, Jody! I just pinned it 🙂 So lovely and unique and amazing and inspiring and I want to make one right now! Love it. Fabulous in every way. Just like you! This is amazing!! Such a great idea and looks fantastic. Amei esta proposta. A vontade que tenho é de fazer 1 por ano com as mãozinhas de meus pequenos. Adorei a singeleza do trabalho. What a great idea! She will be down for a visit soon, I bet! And now I know what I’m making for Christmas presents! It’s darling! Cute idea!!! It is simple and creative. I think I may bust out a pair of these for Christmas.